My stepfather is an incredible cook. I don’t know what he does, but whenever I’m visiting, the most amazing plates of food come out of that kitchen. What I find especially impressive, though, isn’t the exotic meals I’ve never tried before, but when he turns out a classic dish that is somehow better than every other version I’ve had. He makes a romaine salad that I can’t stop eating – I just eat more and more, and it’s only lettuce! A man who can make lettuce addictive is someone I want to learn to cook from. 1. 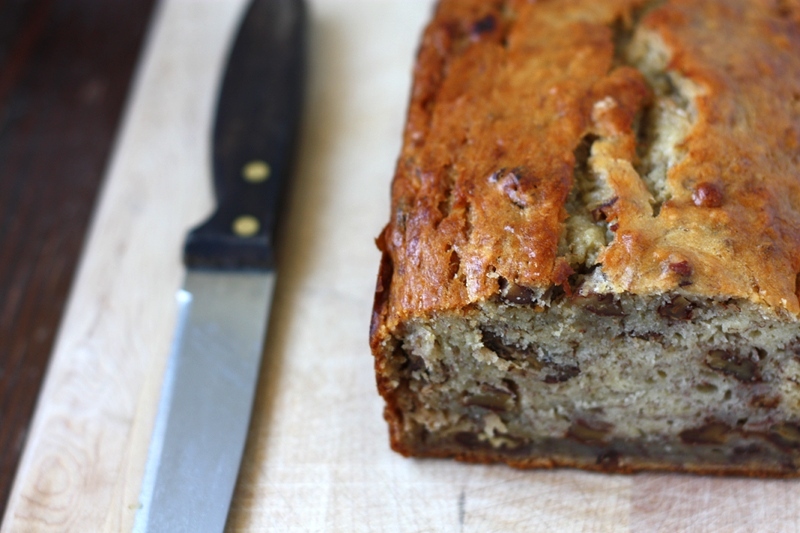 You have to use really ripe bananas. Sort of alarmingly overripe. Really, they should be brown enough that you’re kind of embarrassed if your friends happen to come over and spot them in your fruit bowl, because you know then they’ll think you’re a slob who keeps rotting fruit lying around the kitchen. But once you explain that it’s for purposes of banana bread, all will be forgiven! 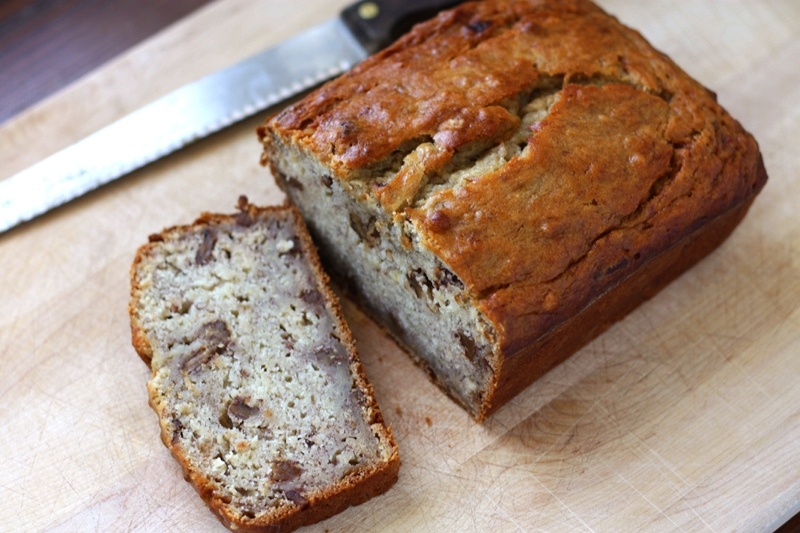 This makes an ultra-moist, banana-y loaf, crunching with toasted nuts. 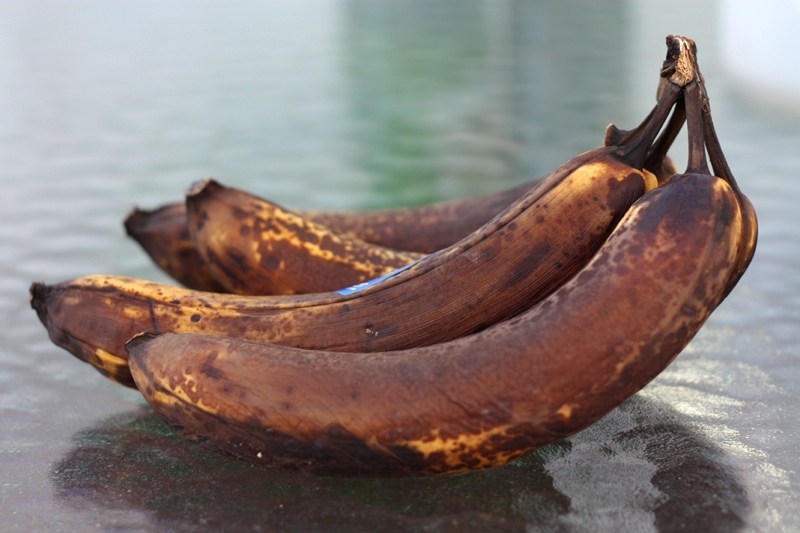 If you prefer a cakier texture, drop the bananas back down to three, but I’ll be sad! Preheat oven to 350 degrees. Grease the bottom and sides of a 9 by 5-inch loaf pan; dust with flour, tapping out the excess. In a medium bowl, mix the mashed bananas, yogurt, eggs, butter, and vanilla with a wooden spoon. Lightly fold the banana mixture into the dry ingredients with a rubber spatula until just combined and the batter looks thick and chunky. Fold in walnuts as carefully as possible. Scrape the batter into the prepared loaf pan. Bake until the loaf is golden brown and a toothpick inserted in the center comes out clean or with very few crumbs, about 55-70 minutes. Cool in the pan for 5 minutes, then transfer to a wire rack. Serve warm or at room temperature. (The bread can be wrapped with plastic wrap and stored at room temperature for up to 3 days). I currently have approximately a bajillion cranberries left over from overenthusiastic Thanksgiving grocery shopping. I know they keep well for a while, but I think I’m starting to push my luck, so a series of cranberry items have begun to appear in my house. 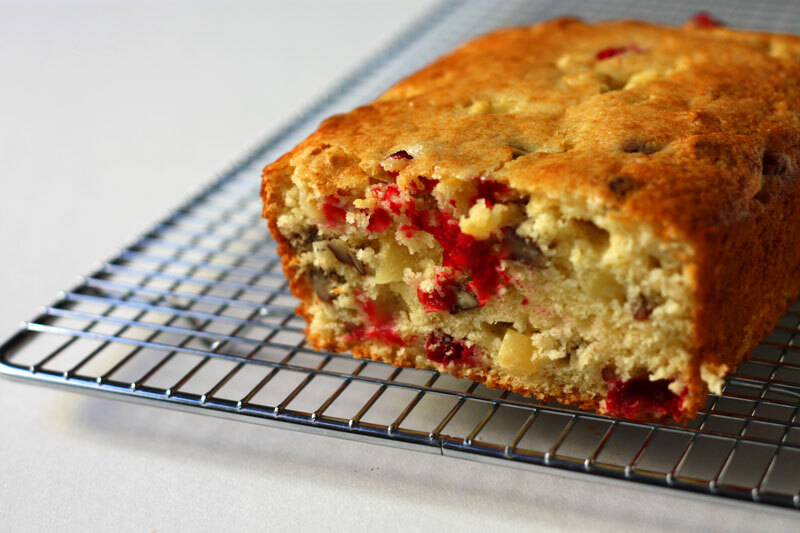 The first was this apple-cranberry pecan loaf, which I have to say is quite a respectable use of cranberries. I got the recipe from my Magnolia bakery cookbook, which I’ve actually never used before. Immediately after I bought it I started reading terrible reviews, and was generally discouraged from making anything from it. It’s always so easy to find recipes online that are pre-approved by hundred of reviewers that my cookbooks have actually started to feel risky. But I’ve noticed that this is somewhat silly of me, so I turned to Magnolia to help with the cranberry glut. This loaf actually turned out really well, I love the tart bursts of cranberries along with the apples and pecans. The cake was really tender and moist, but I thought it could have used a smidgeon more flavour. I might try adding a splash of vanilla to the batter next time, and it might also help to toast the pecans first… anyhow, many variations are possible, but this was also good as written. In fact, my roommate thought I was crazy for insisting it needed modification. So I’d say it was a success! Preheat oven to 350°F. Grease a 9×5 loaf pan. In a large bowl, sift together flour, sugar, baking powder, and salt. Make a well in the centre and add liquid ingredients. Stir until just combined, being careful not to overmix. Gently stir in apples, cranberries, and nuts. Pour into prepared pan and bake until a cake tester comes out with moist crumbs, about 50-60 minutes. Don’t overbake this or it will be dry! Note: I can’t vouch for this as I haven’t tried it, but next time I plan on adding a teaspoon of vanilla along with the wet ingredients. My roommate came downstairs this morning to find me buttering loaf pans. 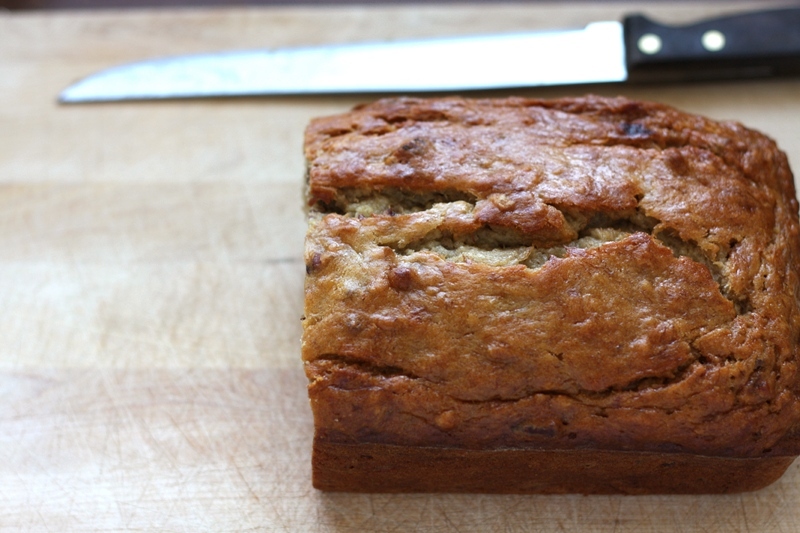 ‘Oh, are you making banana bread?’ That would have been the logical thing to do. My freezer currently contains several black bananas that are crying out to be turned into something delicious. But I refuse to let my baking be dictated by practicality! And it is fall, and I wanted pumpkin bread, so pumpkin bread we shall have. 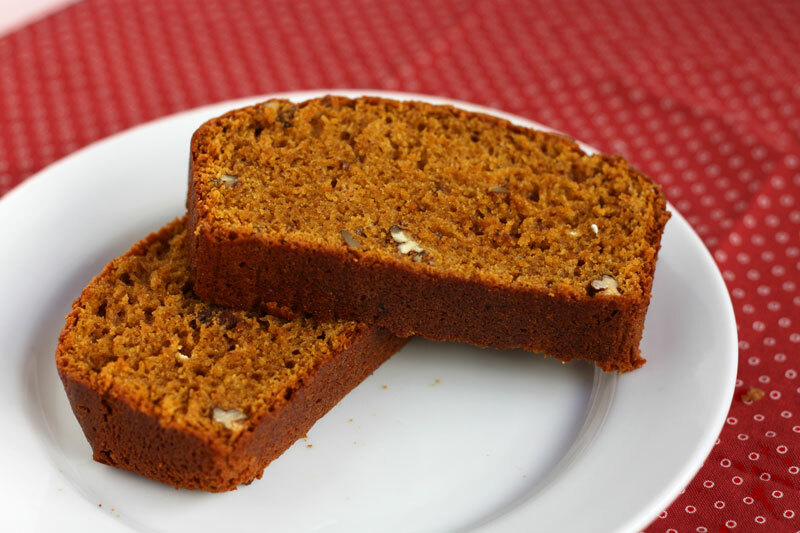 My craving was set off when I stumbled across a recipe claiming to be the Ultimate Pumpkin Bread. I still felt compelled to make some adjustments, but I present my version here to you today. 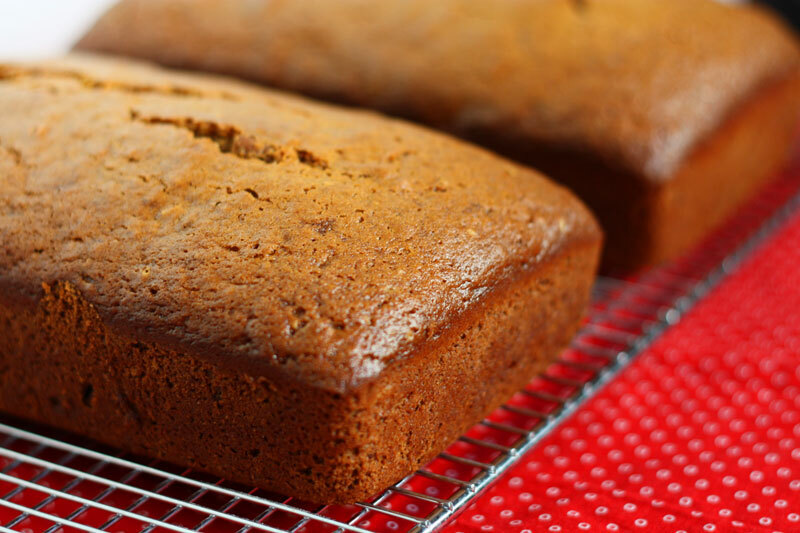 It does seem entirely possible that this is the best pumpkin bread ever. 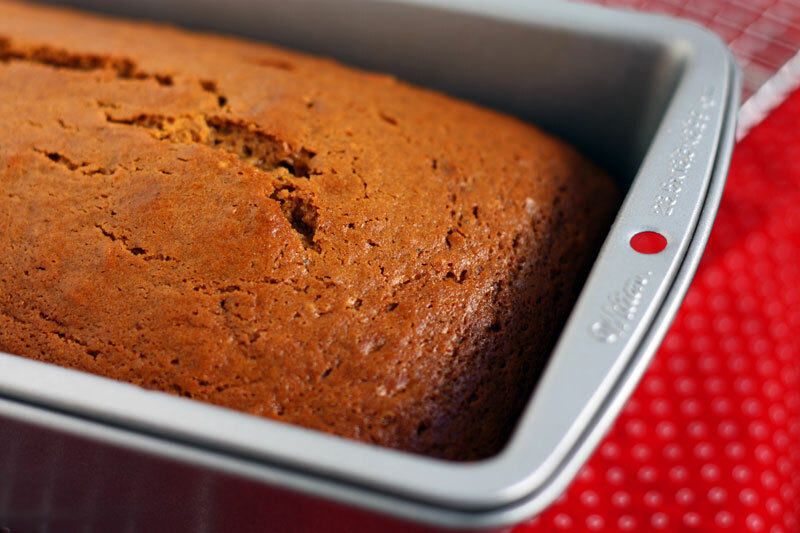 It’s lightly spiced, which doesn’t overwhelm the pumpkin, and using butter instead of oil (which most pumpkin breads do) really improves the taste. It’s incredibly moist, and if you eat it warm from the oven, the combination of that and the crunchy crust might induce you to eat half the loaf. 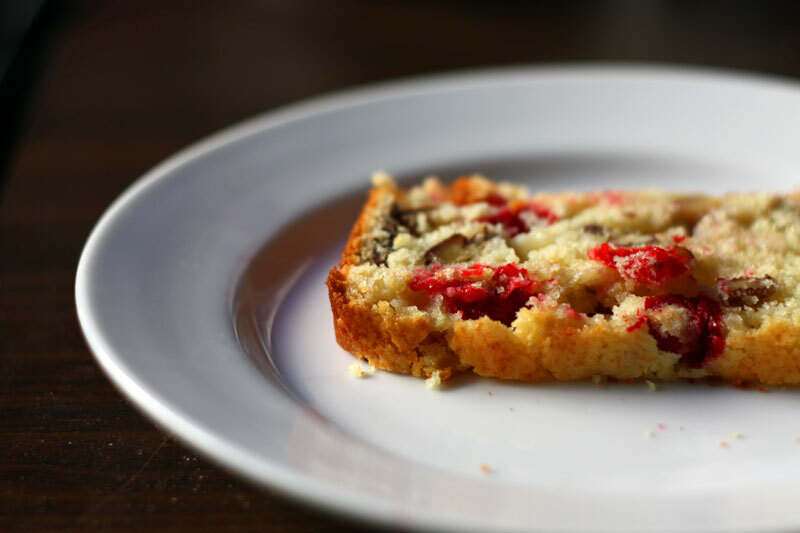 Also, if we’re going to be technical about it, it really seems like more of a loaf cake than a quick bread, given how sweet and tender it is. Oh, and my house smelled fantastic for hours. I think I made the right decision. I have to go eat more now. Preheat oven to 350˚F and butter two loaf pans. In large bowl, beat together sugars and melted butter. Add the eggs. Beat with the whisk attachment of a hand mixer, on medium speed for about 2 minutes or until fluffy (mine didn’t get fluffy). Add the pumpkin and combine well. In three batches, add the dry ingredients and mix gently until each batch is just incorporated. Scrape the sides between each batch. Pour batter into two prepared pans. Bake until a tester comes out clean and the top is golden, about one hour. Cool in pan for ten minutes, then run a knife around the sides and turn out onto a wire rack. 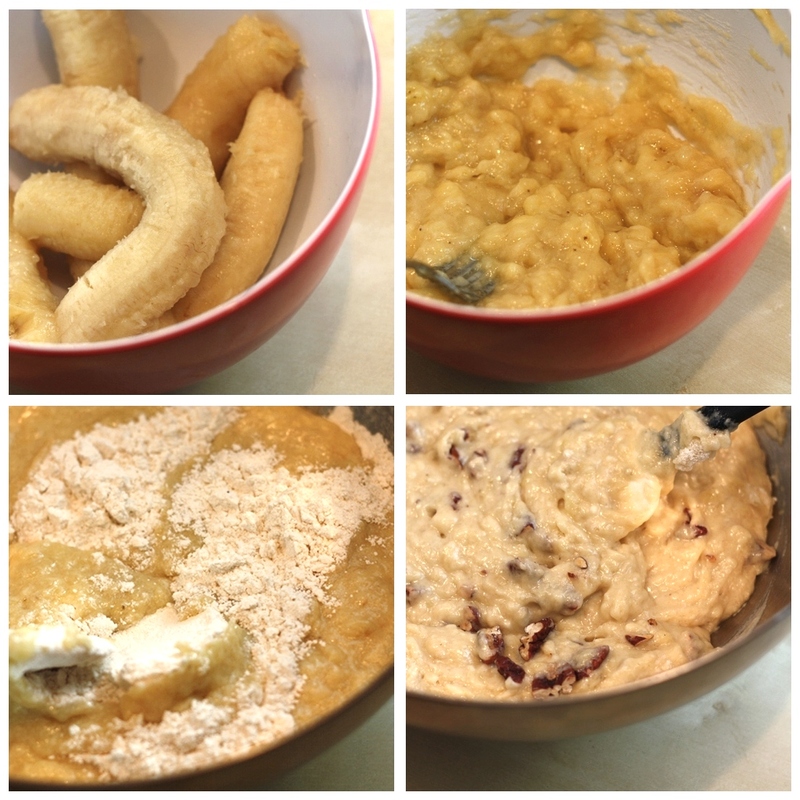 Note: I probably should have sifted the dry ingredients, the batter was kinda lumpy. But still delicious, so I haven’t really learned my lesson. You are currently browsing entries tagged with quick bread at one cake two cake.